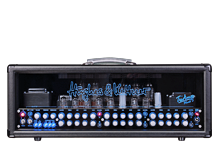 I have been a proud user of Hughes & Kettner amps and accessories for over two decades now. Night after night and tour after tour, their superior sound constantly reminds me of the great care and consistency borne into these unique products. And because of this, it’s very important for me to look forward and trust in Hughes & Kettner as a huge part of my future as well as my past. Tony MacAlpine began his professional music career in the mid eighties with the recording of several influential CD’s like “Edge of Insanity” which featured Billy Sheehan and Steve Smith and “Maximum Security” with George Lynch, Deen Castronova Atma Anur and Jeff Watson. Mr. MacAlpine has been the Guitarist for the Grammy Nominated band CAB for 6 years now that also features Patrice Rushen, Bunny Brunel and Virgil Donati. They have toured extensively in Europe and are quite popular on the Jazz Rock music scene. When he is not too busy with his own projects, Tony can often be found playing Keyboards and Guitar with Axe Master Steve VAI. He has been an active and featured member of this band for 4 years having played in almost every continent on a yearly basis.Mr MacAlpine continues to work with new talent as a producer and instrumentalist for many new up and coming singers and players. His love and respect for music having been nurtured since his early days as a Piano major at the Springfield Conservatory of Music in Massachusetts and continuing at the Hart School of Music at the University of Hartford have helped him earn considerable appreciation among his peers. His unique dual approach to both Piano and Guitar have helped him create a place in the Modern Music world as one of the most Original musicians to emerge from the United States.